It’s not often when a founder of a successful beauty brand decides to branch out and launch another one, alongside the original one. That in itself intrigued me, when I heard that Marina Shcherbinina, founder of NuBo beauty, is launching a new beauty concept. When we met for breakfast before the start of the summer holidays, Marina showed me the pre-launch samples of her new brand, which were due to be launched on QVC in late July. Marina is not a woman to rest on her laurels, so after building from scratch a successful brand NuBo in London a few years ago, which now sells also in Europe, Hong Kong and Russia, she felt that she was ready to introduce Bio-Extracts to the world. Sitting at the breakfast table and listening to marina talk about her new brand, I ‘played’ with serum syringes & thought to myself that it all looked like Lego for our face – pieces of the puzzle coming together to build protective armour for your skin. Russian women pride themselves on their appearance and Marina, who has scientific background, wanted to utilise the power of bio-technology and its use of highly purified ingredients. By extracting plant actives, Marina and her team choose to focus on creating bespoke solutions to multiple skin problems. Bio-extracts deliver effective and bespoke formulations that will also satisfy exacting vegan standards. By offering airless jars, that at a touch of a finger dispenses an exact amount of cream, you can also boost its efficacy with up to four serums that come in separate booster syringes. So you have functional packaging and effective skincare, which also harnesses the power of mood-boosting fragrances. You can also expect non-greasy, rapidly absorbed formulas, some of which will also have a gently cooling effect on your skin. After our meeting I went home with the prototypes and in the course of the summer I was giving Marina my initial feedback. What also intrigued me, is Marina’s use of multi-lamellar system in her new skincare formulas. The upper layers of the skin, body’s lipids, oils and fats, are organised into highly-structured, lamellar arrangement, which form the skin’s barrier function, keeping important fluids in and external aggressors out. Bio-Extracts multi-lamellar system carries a distinct structural similarity to those natural skin layers, mimicking skin’s own lamellar structure. It is designed to act like a ‘patch’ on the skin, restoring its barrier function and so preventing trans-epidermal water-loss. It also makes a great base for other active ingredients in the formula, as it helps to ensure a uniform distribution of the actives for optimal skincare performance. The system, originally developed for treating extra-sensitive skin types, offers an innovative type of moisturiser, a step ahead from ‘water in oil’ or ‘oil in water’ emulsifiers. One of the keys to skincare performance is an effective delivery system. In case of Bio-Extracts you have phospholipids-based delivery system, that ensures that Bio-Extracts actives penetrate deeper into the skin layers, thus helping to restructure and repair cellular membranes & preserve skin integrity and health. How does the Bio-Extracts system work? You do a self-skin assessment via Bio-extracts website and then choose moisturiser and boosters. Then, every morning and night, you mix up to four boosters, depending on your skin’s needs in the moment in time, and add them to the pre-measured dose of moisturiser, apply it to your face, neck and decollete and you are ready for the day ahead or to lay or head on the pillow, while your skin regenerates & repairs. When it comes to moisturisers, you simply press down either side of the plate lid with your thumb to dispense a pre-measured amount of the cream on the plate lid. Then, examine your skin in the mirror and decide if you want to use it on its own, or mix it with a booster shot. If you choose to add a booster, simply mix it into your moisturiser with a clean finger and apply lovingly to your face. – Light Moisturiser: suitable for oily, problematic and combination skin. I found it worked perfectly for my skin in the summer and have continued to use it thus far into the autumn. It has ultra-light formula that mattifies the skin which is quickly absorbed into the skin. Expect well-hydrated skin with some cooling sensation upon initial application. – Normal Moisturiser: this one is suitable for day and night use. It contains argan oil & is suitable for normal and combination types of skin. – Rich Moisturiser: suitable for dry and mature skin types, it works particularly well on most skin types in the colder months. It contains Cupuacu Butter, produced from seeds sourced from this tree, which grows in the Amazon (don’t confuse it will online retailer ), which helps your skin feel well hydrated for longer without skin feeling overloaded. At the base of those three moisturisers lie bio-mimetic emulsifiers, of 100% vegetable origin, which match your skin’s lamellar structure. Their role is to act as ‘second skin’ and help restore the barrier of damaged skin. The formula is quite mild, so even if your skin is sensitive, with regular use it will help to build up skin’s tolerance, while sugar esters will help moisturise your skin. Over the latter part of the summer I have been using the Light Face Cream, which absorbs oil and mattifies the skin. But for me it was the scent that caressed my senses and that lingers on my skin. Now, with the weather becoming colder and heating turned on, I switched to the Normal face Cream, which is perfect for the day and its fresh, floral scent is again a winner for me. If your skin needs some extra moisture, then go for the Rich one ( it won’t feel heavy on the skin, but will make the skin feel soothed and cocooned. Perfect for travel or when you go skiing or mountain hiking ). 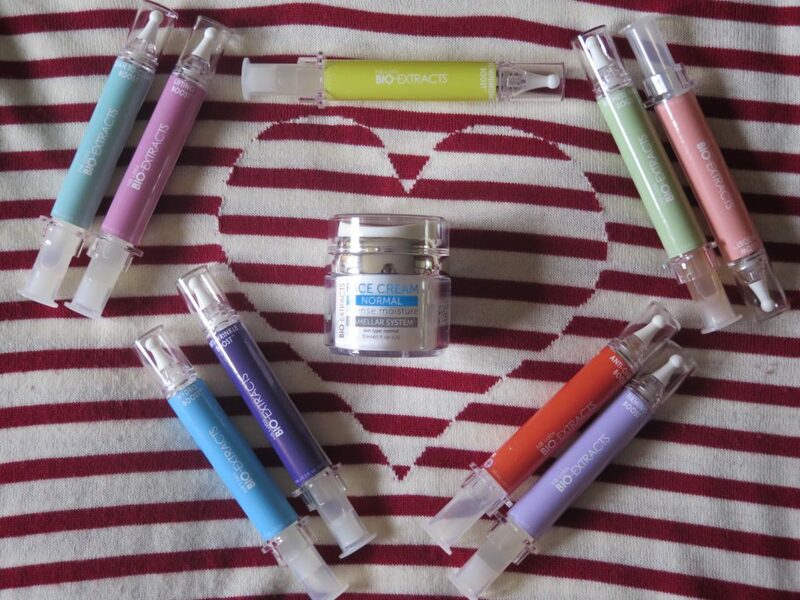 Whatever your skin needs, Marina made sure that a certain booster is on offer for you to choose from – you have quite a choice ! Anti-Wrinkle: it was developed with the aim of helping release lines caused by intrinsic and extrinsic ageing, reducing the depth of facial wrinkles and assisting production of collagen in your skin. The main ingredient is a sequential molecular-release system of the polysaccharides from the Peruvian tree Tara and marine pentasaccharides from the Green Algae. High molecular weight actives will remain on the surface of your skin, acting as a gradual bio-active release system, while small-sized molecules will penetrate the epidermis, where they will activate the collagen synthesis. This booster is clear-coloured, with a neutral scent. It feels like water with a slight gel bounce on application. Sinking into the skin within a minute or two, it gives your skin a slightly cooling, refreshed sensation immediately. In the summer I used to apply it on its own, had a my breakfast and then applied my sun protection cream, which offered adequate protection and hydration for my skin until lunchtime. Now I apply it before bedtime, a few minutes ahead of the moisturiser. Lifting Booster: a purified fraction of 100% natural polyoses, derived from oats, this three-dimensional high-molecular weight network is made of complex sugars, which are linked to each other by intra- and inter-chains hydrogen bonds. This booster is both elastic and flexible, almost like a rubber band you would use to put your hair in a ponytail with, so its will adhere to your skin, forming a cohesive lifting film. This booster is a good one to use before applying your make-up, as it will help your make-up be more long-lasting during the day. Again, clear texture and almost neutral scent contribute to the feeling of protective veil over your skin. Firming Booster is particularly well suited for mature skin. Its key ingredient is a synergistic combination of phytosteroids from Maral Root (Rhaponticum carthamoides) and derivatives of Wild Jujube seeds, which are often used in Traditional Chinese Medicine, as they strengthen skin’s internal structure and help maintain firmness and elasticity, thereby improving facial contour definition without the need of the scalpel. It is one of the quickest boosters to sink into the skin and the one I like applying to my always frowning forehead ! Hydro Boost: if you want more supple, moisturised complexion, this is the booster for you. It offers intense hydration with botanical hyaluronic acid, thanks to the extract from the seeds of an Indian plant Senna. As skin’s surface becomes smoother, fine lines become less visible. With regular use in the morning and night I noticed my skin not only looks more radiant, but somewhat rejuvenated as well, which is particularly welcome now, when the suntan is starting to fade and complexion becomes more tired due to daily stresses of city life. Glow Boost: Every day we face external aggressors that cause oxidative stress and premature ageing of our blood vessels, some of which are close to the skin surface on our face and might be particularly noticeable during the cold months, due to the poor micro-circulation and dullness of the skin surface. Active plant molecules from the Wu-Zhu-Yu fruit (evodia rutaecarpa) have been used for years in traditional Chinese medicine. Thanks to Marina’s knowledge and lab methods of bio-technological extraction, this booster offers optimum concentration and stability of the active molecules, which in turn, upon contact with the skin, enable the relaxation of micro vessel walls, thus improving skin’s micro-circulation. This in turn contributes to the better nutrition of the skin’s support tissues and your skin becomes more even and luminous. This booster is one of my personal favourites and I use it almost religiously in the mornings. Anti-Oxidant Booster: Antioxidants for our body’s defence system, which offers protection to skin cells from external aggressors. Over time, as we age, our skin cells ability to maintain balance of production of oxidants weakens. Combining Rosmarinic acid from Lemon balm, anti-oxidative flavonoid ruin sulphate, as well as zinc, manganese and selenium extracted from barley, this booster offers a powerful combination, which helps to counteract cellular oxidative stress. This is another booster that is one of my particular favourites and it seems to work well irrespective of the season – be it on its own, or mixed with the moisturiser. Clean to Clear Booster: this is an exfoliating boost. While exfoliating is the must treatment for problematic skin, it is also very important for any skin type & especially so for mature skin for effective, yet gentle skin cell renewal. Marina, brand’s founder is a big fan of exfoliating and says this booster is gentle enough to be used daily, if you have slightly more mature skin, while young women should exfoliate once or twice a week. The lead role is played by Willow Bark Extract, which contains natural salicylic acid, normally used for acne treatment because of its ability to help skin shed dead cells and keep pores clear. The natural BHA contained in Willow Bark extract also has the benefit of potentially causing less irritation than a synthetically derived one. The booster focusses on reducing the inflammatory process, gently exfoliates the skin with the help of natural hydroxy acids, giving skin a clearer appearance. It also contains flavonoids and tannins, which are powerful antioxidants that help protect the skin from the harmful effect of free radicals. To top it all, willow bark also helps to clear bacteria that can cause acne or other skin issues, like rosacea or eczema. Redness Relief: this booster is the anti-inflammatory treatment for the skin, with the key role played by a bio-extract from Eperua Falcate, a tree that grows in the rainforests of French Guinea. It helps reduce micro-inflammation in the skin, thus helping to strengthen skin’s natural protective barrier and reducing redness, particularly in the skin prone to rosacea. Rich in flavonoids, this natural plant active also reduces skin’s hyper-reactivity by blocking the inflammation cascade. I found that this booster worked nicely after sun exposure. While I always protected my skin with high SPF a combination of sun, sea and sand can cause the skin to get annoyed with your ‘frivolous’ behaviour, so this booster came to the rescue nicely. What draws me to Bio-Extracts is the fact that they celebrate and focus on individuality of our skin, when one solution doesn’t fit all. There are so many factors that have an impact on our skin, from genes to stress, from the amount of time we sleep to the environment we live in. So having a personalised skincare routine, that addresses your skin’s daily needs is a great solution for a busy modern woman, who doesn’t want to compromise on how she looks. This is why I call it my Beauty Lego Kit, much to the amusement of my kids, who adore their construction sets and play with them depending on their creative mood. I do the same, after looking at myself in the mirror and taking into account my lifestyle in the last 24 hours – did I sleep enough? Drink enough? Did I get stressed? All that determines the moisturiser and boosters I choose morning and night and make me feel unique, a fact celebrated by Marina & Bio Extracts team. An added bonus is that the products are affordable without breaking the bank or making you feel guilty, with each booster costing £19.50 and moisturisers retailing at £27. If you look at QVC website or Bio-Extracts own site, you can also find some special deals, combining a suitable moisturiser with a choice of boosters, as well as samples that you can order, before purchasing full-sized products. Bio-Extracts can be purchased via brand’s website or via QVC shopping channel.